The NQ Clarifier is another serious air purifier product - with four stages of filtration and UV. It uses HEPA filtration, activated carbon and UV light - and NQ states that it can be used in various applications - such as residential, commercial, medical, military or industrial. NQ's HEPA filters come with certification of their "true HEPA" status. There is also a special "Medical" version of the NQ Clarifier available - which increases the amount of UV light by 66% for stronger germicidal action. The NQ Industries Clarifier Medical Plus features four germicidal UV lamps, and is stated to be ideal for use in cleanrooms, hospitals, laboratories, or other types of medical facilities. NQ makes several other products - such as the NQ Clarifier NQ250, NQ Clarifier NQ400, NQ Clarifier NQ500-C, NQ Clarifier NQ 1000, and NQ Clarifier NQ 2000. 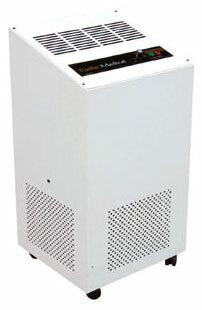 The NQ Clarifier NQ1000-R-M Air Purifier is suggested for commercial, medical, industrial or military settings. The NQ 1000 is a serious high-end unit standing 86 inches high and weighing 184 lbs. It increases the number of UV lamps to six and is recommended for addressing airborne bacteria, viruses, fungi and molds. Despite its high ticket is designed to be a more afforable and movable substitute to a permanent facility installation. The NQ 1000 and 2000 feature three levels of mechanical filtration in addition to UV light sterilization. 3) UV light - to address the problem of bacteria and viruses. However, NQ does not limit itself to there three. One of the technologies employed by NQ is Ultra Violet Photocatalytic Oxidation (UVPCO). NQ states that they have been using this "cutting edge technology" since 2006 - and that it increases efficacy of NQ products in which it is used, against certain VOCs, odors and chemical pollutants. Another thing that impressed us about NQ was the fact that they disclosed the results of several scientific tests and clinical trials on their web site.